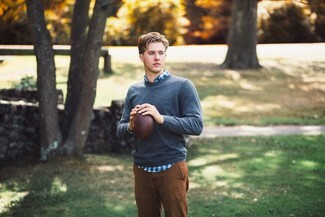 If you're hunting for a casual yet on-trend outfit, wear a Calibrate honeycomb crewneck sweater with brown chinos. Both items are totally comfortable and will look great together. If you're on a mission for a casual yet dapper outfit, dress in a Calibrate honeycomb crewneck sweater and yellow chinos. Both garments are totally comfortable and will look great together. Go for a pair of white low top sneakers to make the look current. 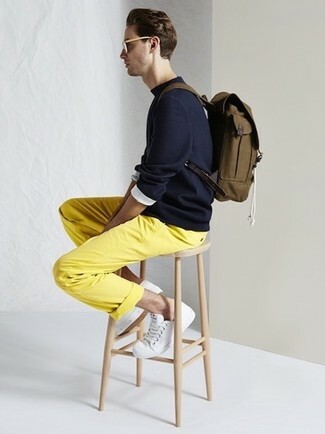 If you're after a casual yet on-trend getup, dress in a navy crew-neck sweater and khaki chinos. Both garments are totally comfortable and will look great together. Bring instant interest and excitement to your getup with dark purple leather casual boots. 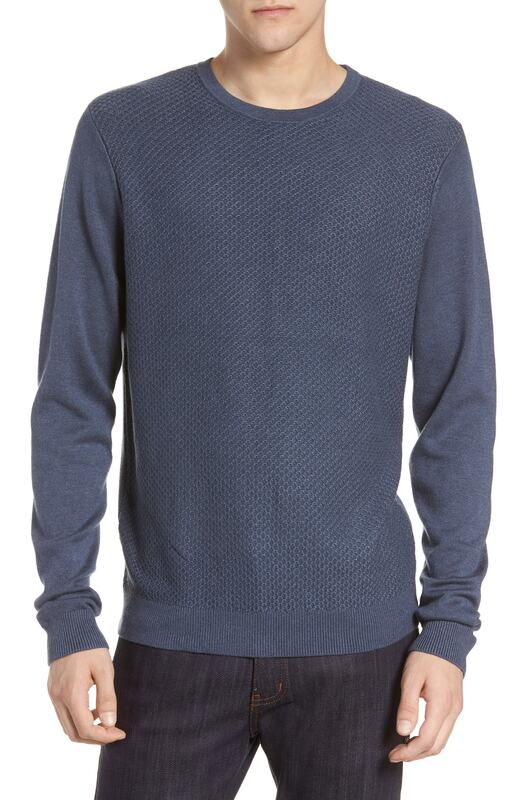 If you're after a casual yet dapper ensemble, consider wearing a navy crew-neck sweater and navy jeans. Both garments are totally comfortable and will look great paired together. 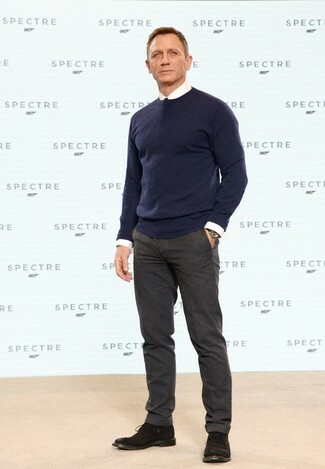 For a nothing less than incredibly stylish getup, wear a navy crew-neck sweater and dark brown wool dress pants. 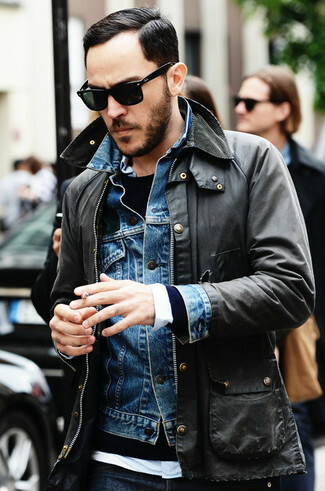 Dress down this getup with dark brown suede desert boots. If you're after a casual yet sharp ensemble, consider pairing a Calibrate honeycomb crewneck sweater with light blue lightweight jeans. Both pieces are totally comfortable and will look great together. Sporting a pair of navy suede derby shoes is a simple way to add extra flair to your getup. If you're on a mission for a casual yet seriously stylish ensemble, consider teaming a Calibrate honeycomb crewneck sweater with olive chinos. Both garments are totally comfortable and will look great together. Up the cool of your outfit by wearing brown leather casual boots. 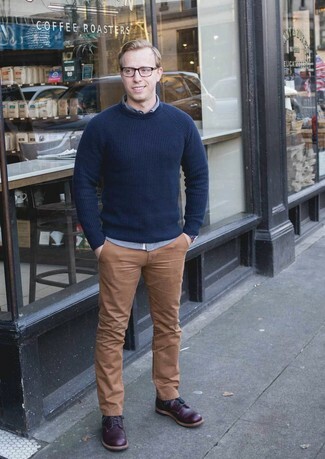 If you're in search of a casual yet seriously stylish look, dress in a Calibrate honeycomb crewneck sweater from Nordstrom and burgundy chinos. Both items are totally comfortable and will look great together. Mix things up by wearing white leather low top sneakers. 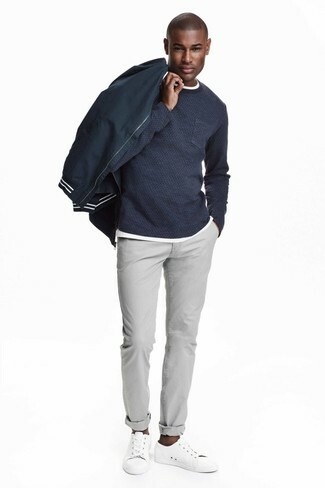 If you're on the lookout for a casual yet stylish look, try pairing a navy crew-neck sweater with grey chinos. Both garments are totally comfortable and will look great together. White leather low top sneakers will add more playfulness to your getup.